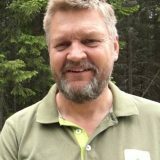 Forestry.com continues the ongoing coverage of the CTL markets of the world. 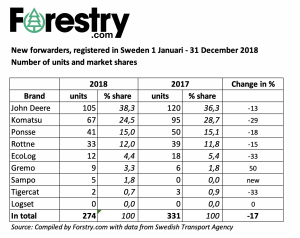 Now, the time has come to look at forwarder sales in Sweden, which for a long time was the leading CTL market with around 700 new machines (forwarders and harvesters) sold per year. Nowadays Russia is the leading market for purpose built, wheel-based CTL machines, with Sweden in second place. With the aid of statistics from Swedish authorities we have now compiled the number of forwarders that were registered in Sweden in 2018. Following a good year in 2017 the number of registered forwarders went down by 17% last year compared to the year before. In total, 274 new forwarders with a capacity of over 8 ton were registered in 2018, and that’s a low number compared to most years since 2005. Only two years – 2009 and 2013 – saw fewer forwarders registered in Sweden. If you’d like to take a look at our compilation of the 2017 forwarder market, you’ll find it here. 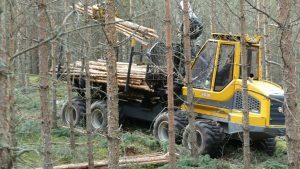 You can also find a report about the Finnish CTL-market (both forwarder and harvester statistics) published here at forestry.com in January. Sampos smallest forwarder FR28 is a typical thinning forwarder with a loading capacity of 10 tons. In 2018 the first five Sampo-forwarders were registered which means that there’s a new player on the Swedish forwarder market. Sampo also showcased two new forwarders of heavier weight classes at the Metko fair last year, and it’s probably not a wild guess that they will be showcased in Sweden during one of this summers fairs at Elmia or Nolia. The fight for market shares is increasingly tough! The reason for why fewer machines were registered compared to the year before is likely not related to a decreased demand on the Swedish market. The reduction is more likely due to the fact that the manufacturers aren’t able to produce enough machines for their Swedish customers. For some models you’ll have to wait 6-8 months for a new machine, sometimes even longer. Today, Russia is the single largest CTL* market and as such a lot of forwarders are being shipped east. At the same time the world’s CTL markets are screaming for more machines and all manufacturers are building as many as they can. The bottleneck is, sadly, the fact that it’s not possible to get sufficient volumes of transmission and hydraulic components. There’s been a boom for several years in many parts of the world and in many machine-related fields. This means that certain critical components have been in short supply. 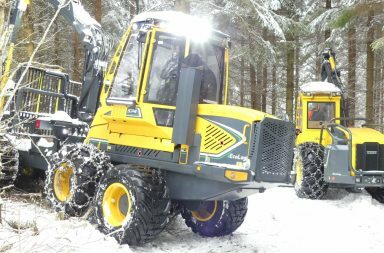 When speaking with companies who deliver components to the Nordic forest machinery manufacturers, they don’t see any signs of demands falling in the coming 12 months. Quite the opposite. This must certainly mean that more CTL machines will be built in 2019 than any previous year in history, and hopefully we’ll also see more machines built for Swedish customers. 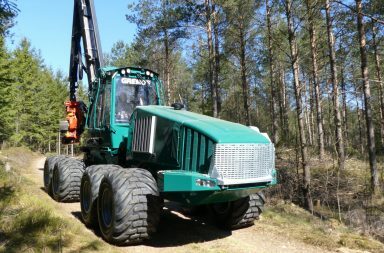 Considering that the logging activity is high in Sweden, the need to replace more machines is likely building up. 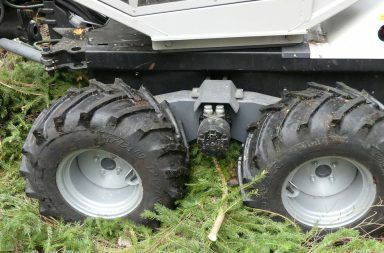 As such, 2019 can certainly become a great sales year for forestry machinery in Sweden, if the manufacturers are able to produce enough of them. The market shares and weight class division must be viewed with a certain degree of reservation as they might mirror the various manufacturers’ abilities to deliver different types of machines to the Swedish market rather than the actual demands of the customers. The total forwarder market of 2018 has gone down by 17%. Three companies increased their shares compared to 2017 and that’s John Deere, Gremo and Sampo-Rosenlew (new to the market). Komatsu Forest and EcoLog have lost market shares compared to the year before. However, it’s a matter of relatively minor changes where some few machines have a great impact. If you look at the load capacity of the registered forwarders, the average size has increased at a stable pace during the past few years, but that trend was broken in 2018. 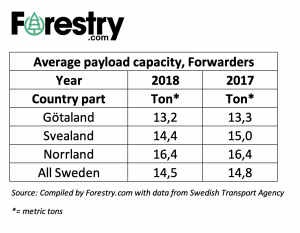 Last year the average forwarder could handle 0.6 tons (payload) less in Svealand (mid Sweden) and 0.1 tons less in Götaland (south). The forwarders in Norrland have not seen a change in terms of loading capacity. In total, there’s now a 3.2-ton difference in payload between the average forwarder in Götaland and Norrland. John Deere is market leader in Sweden when it comes to forwarder sales. 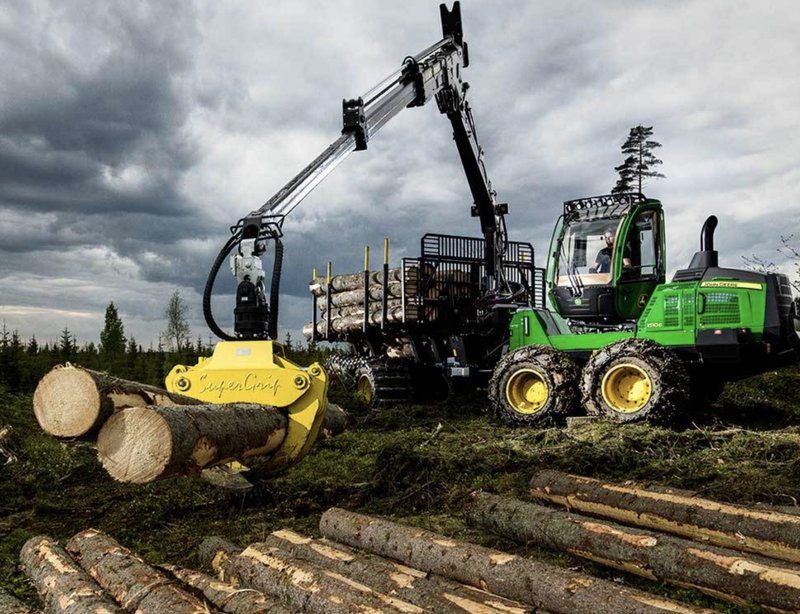 Two of John Deere’s forwarder new G-serie models is in top of the most-sold-list: the 1510G and the largest 1910G. Komatsus 855 forwarder is No three. 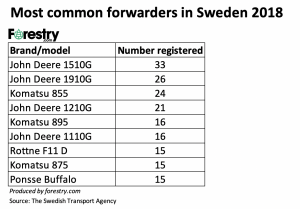 Most common forwarders in Sweden 2018. John Deere rules in Sweden with both the 15010G and 1910G on top. Komatsu 855 is number three.